Songs around a crackling Meskel fire as people prepare to eat together, at St. Saviour Catholic parish in Addis Ababa. As in other parts of the Catholic world, Christmas and Easter are major feasts in the Church calendar. But in Ethiopia, a different feast, Meskel, competes for top billing in the lives as believers. In interviews for this project, almost all of the interviewees, lay and religious, suggested that this was their favorite religious feast of the year, a long-anticipated and special day. Officially, Meskel is a minor Christian feast. Practically, it is a major national event. Perhaps just as importantly, it coincides with the predictable end of a long and difficult season of heavy rains, a kind of wintertime when food supplies fall short. 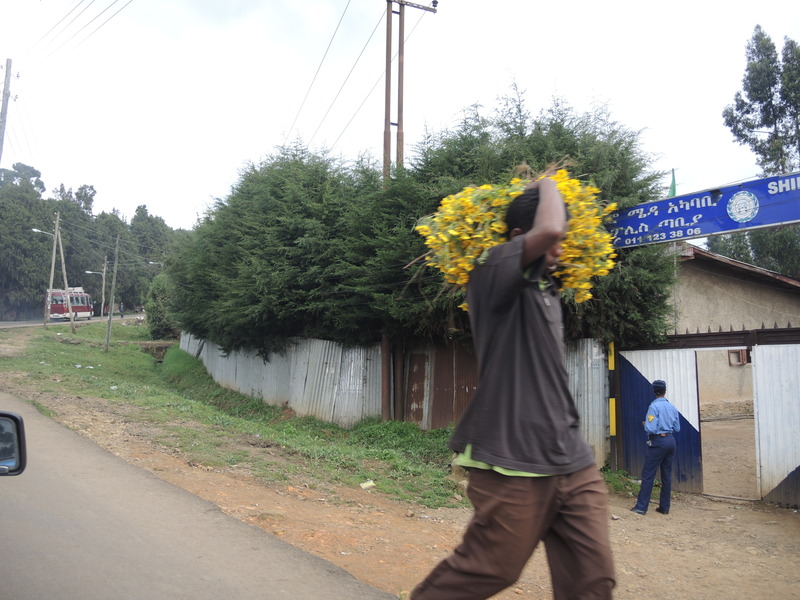 The feast is celebrated (on September 27, according to the Western calendar) at a time when the rains end, and a yellow daisy-like flower, also called meskel, blooms all over the hills surrounding Addis Ababa, the capital of Ethiopia. 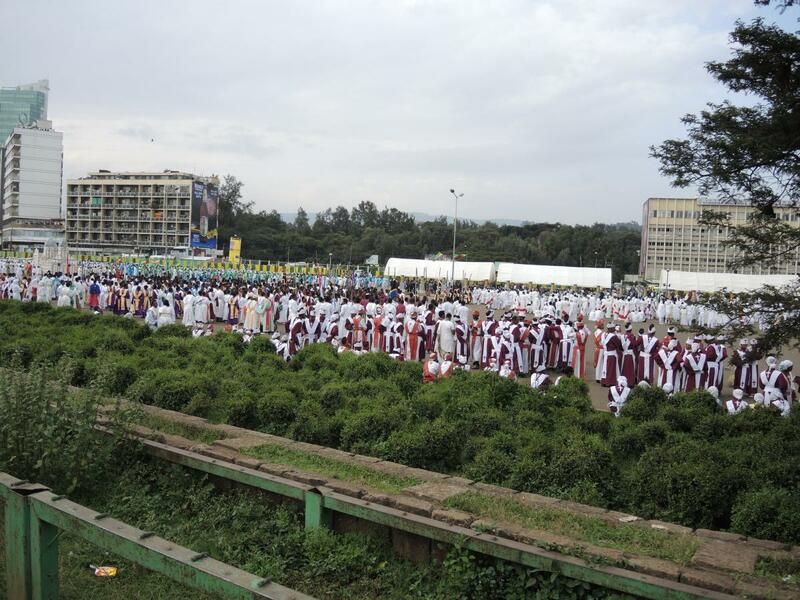 The main national feast is held in Meskel Square, a huge square in Addis Ababa named and dedicated particularly for the celebration of the feast, with a semi-circular stadium viewing area for tens of thousands of people. The celebration is presided over by bishops and civic leaders. In the 2013 celebration pictured here, the Catholic metropolitan archbishop participated in the celebration. 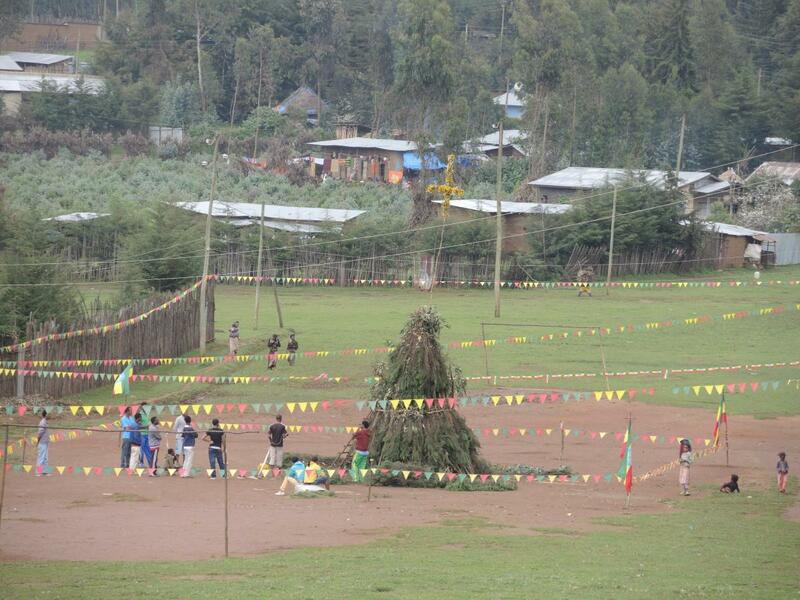 While the celebrations in the capital are large, Meskel is a time when many urbanites return home to villages. 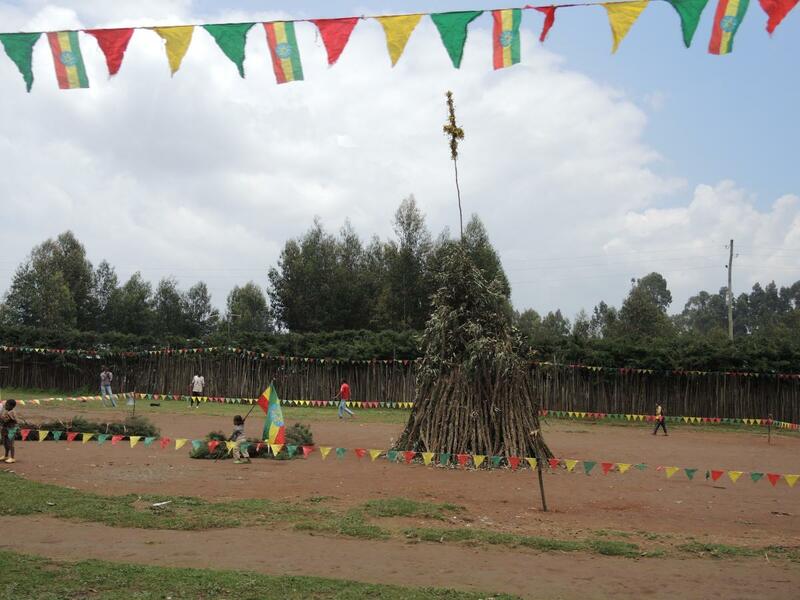 Neighborhoods and villages celebrate the Meskel in thousands of local celebrations. The celebration begins in earnest on September 26, the eve of the feast. 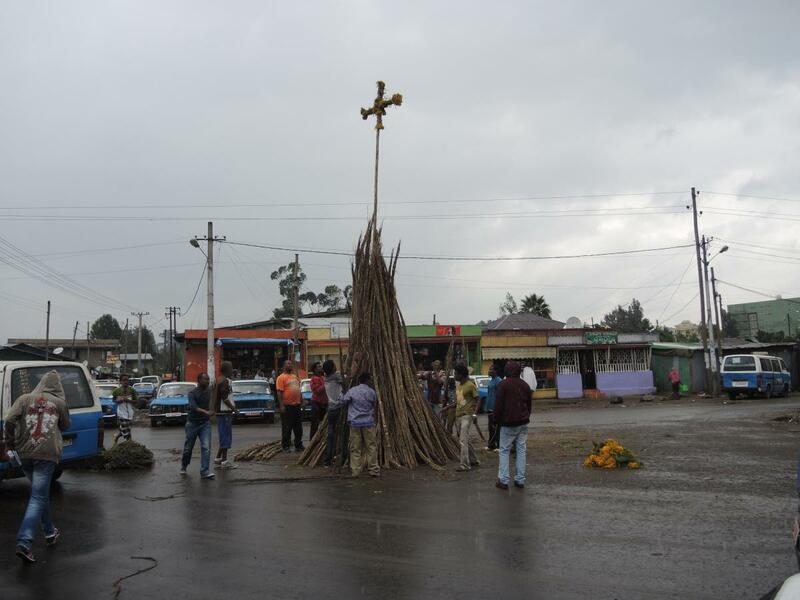 That morning, in public squares or at intersections, people prepare the demera, a tall pyramid of branches that looks from a distance like a like a fir tree, topped with a cross of meskel flowers. In the late afternoon, people dance and celebrate in the area around the demera. At Meskel Square, dozens of large dance groups move through the square below the viewing stand. Clergy and public leaders give speeches, and floats with biblical themes parade around the grounds. As darkness begins to set in, the demera is set ablaze. The smoke is said to recall the smoke that supposedly led St. Helena to the site of the True Cross. 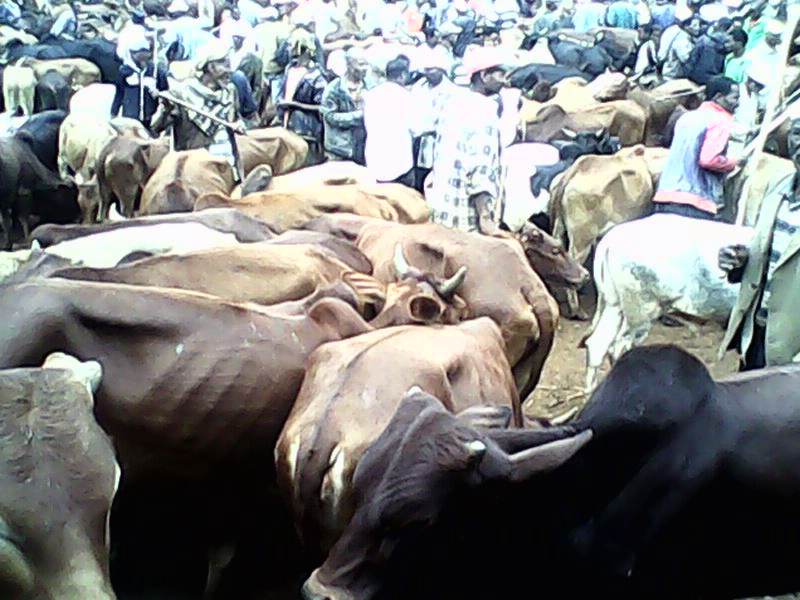 Celebrants then feast together, whether at the demera site or with their families. The following day, the official day of the Feast of the Finding of the True Cross, Ethiopians attend liturgy and a feast and celebrate with family and friends. Many use the ashes from the demera to mark themselves with a cross. 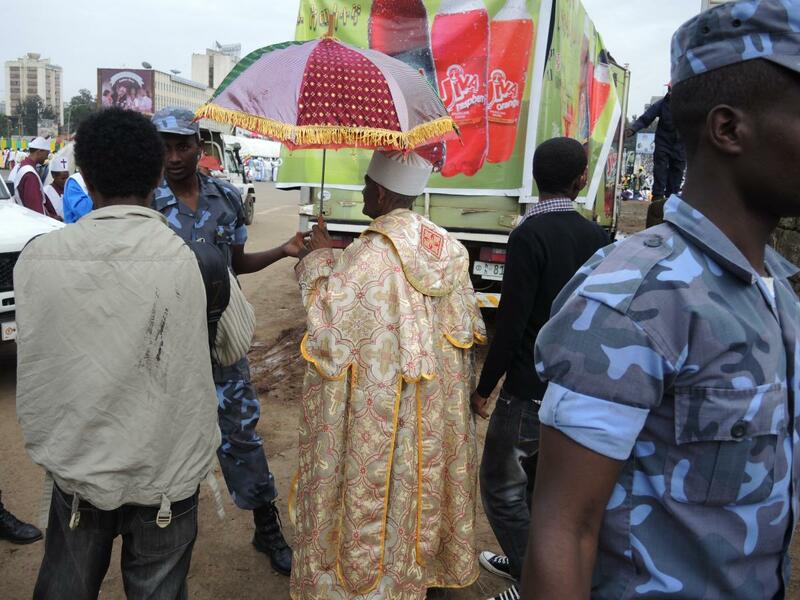 Ethiopian rite Catholics participate fully in the national and local celebrations, and celebrate it similarly as their own feast. 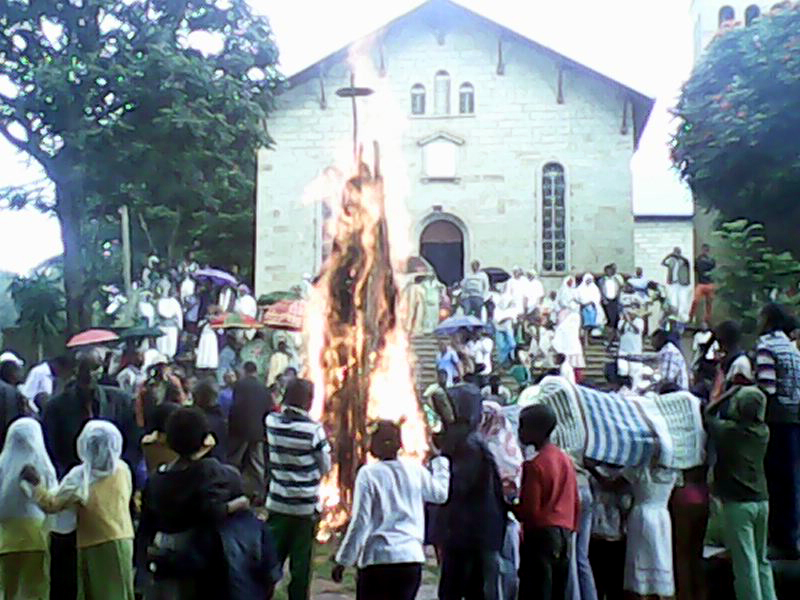 Many Catholic churches have smaller Meskel burnings and feasts later on the eve of Meskel, after the national and local celebrations. 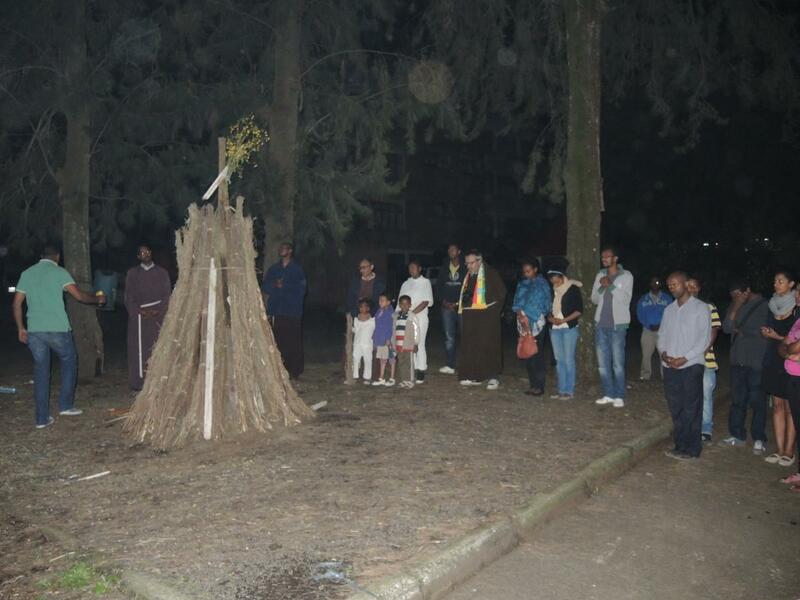 At Holy Saviour, a Catholic parish in Addis Ababa, clergy and parishioners burn their own demera following the burning in the square, and then celebrate around the fire with a special meal. 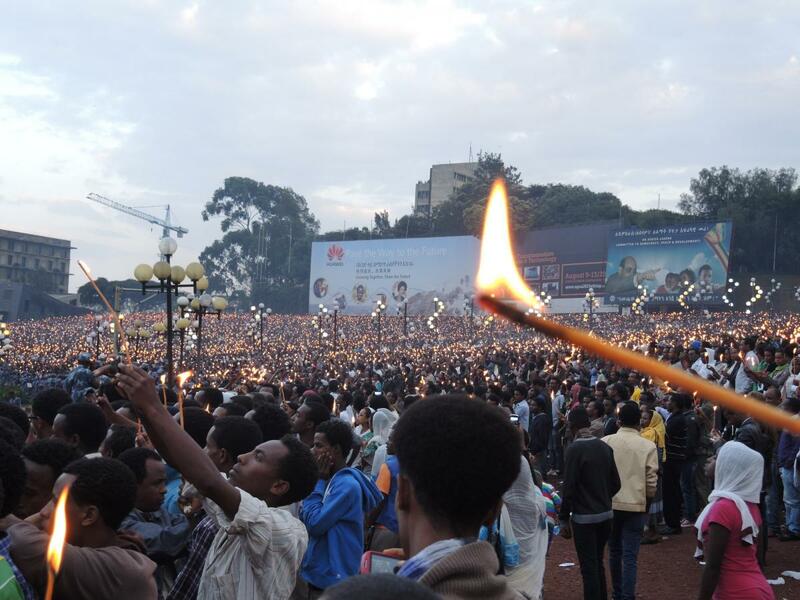 At the Catholic cathedral, the archbishop celebrates with a burning Meskel pyre, the demera, on the following day, the day of the feast itself, after the Mass. 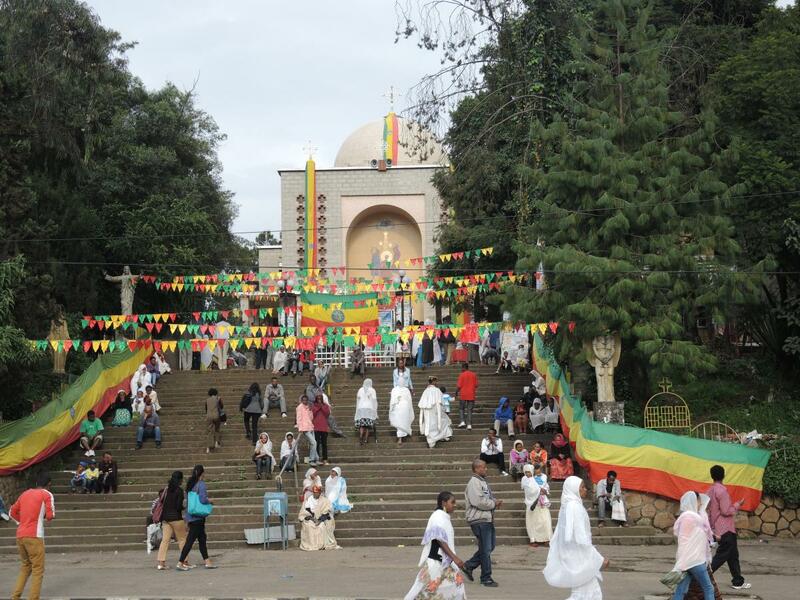 One interviewee, who described Meskel as her favorite feast of the year, told how, after Mass and the breaking of the feast, she would return home for feasting and visits with neighbors and friends. The eating of injera, a flatbread considered a national dish in Ethiopia, took on special Eucharistic significance for the family that day, she said. The man of the house would be in charge of breaking the injera, and the day included plenty of eating and sharing. The ways of celebrating Meskel were no different for Catholics compared to Orthodox neighbors, all reported, except that they went to Mass at different churches. 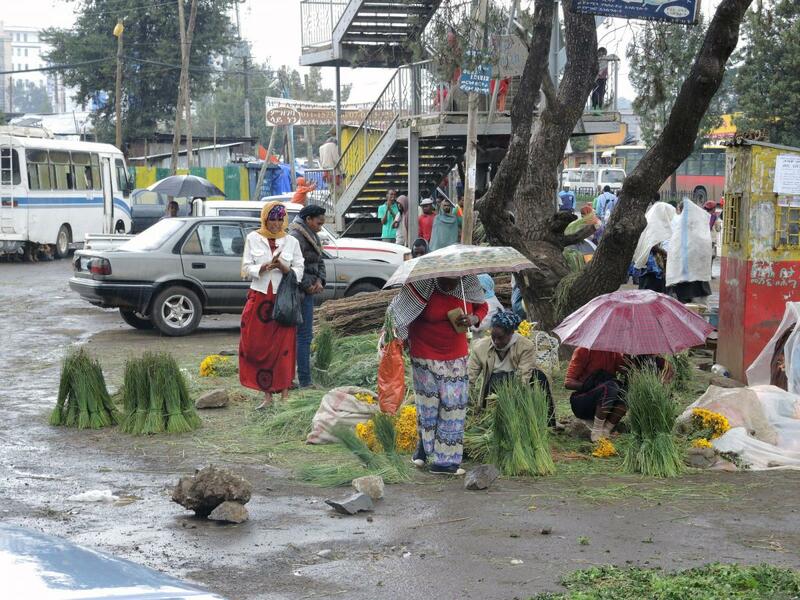 Meskel is said to be particularly valued and well celebrated among Gurage2 people. 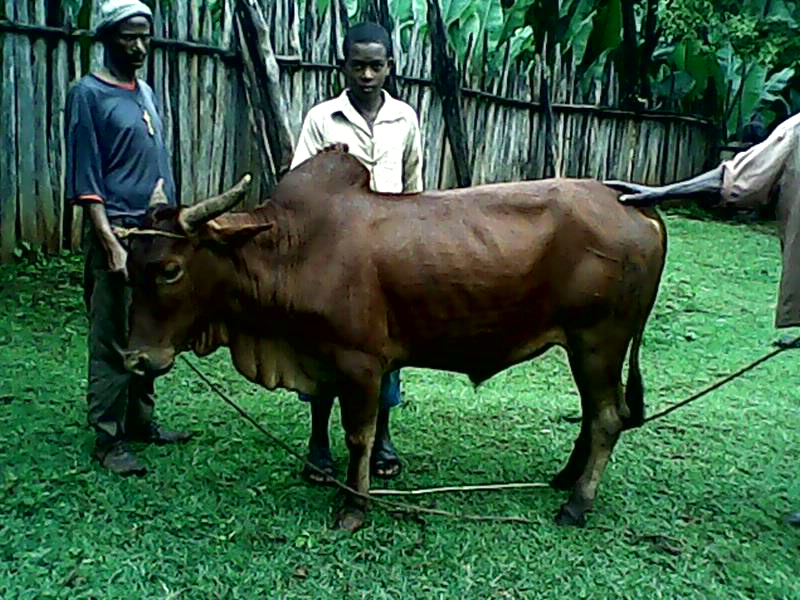 Adult children, especially those who have moved away from the village in search of their fortunes, are expected to provide a bull or goat for their parents to slaughter for Meskel. Those children who do not honor this responsibility may be cursed for failing their families. The slaughter itself is part of the feast. An elder male blesses the animal with the sign of the cross, a request that God save the people in the coming year and provide prosperity for the children who provided the animal. 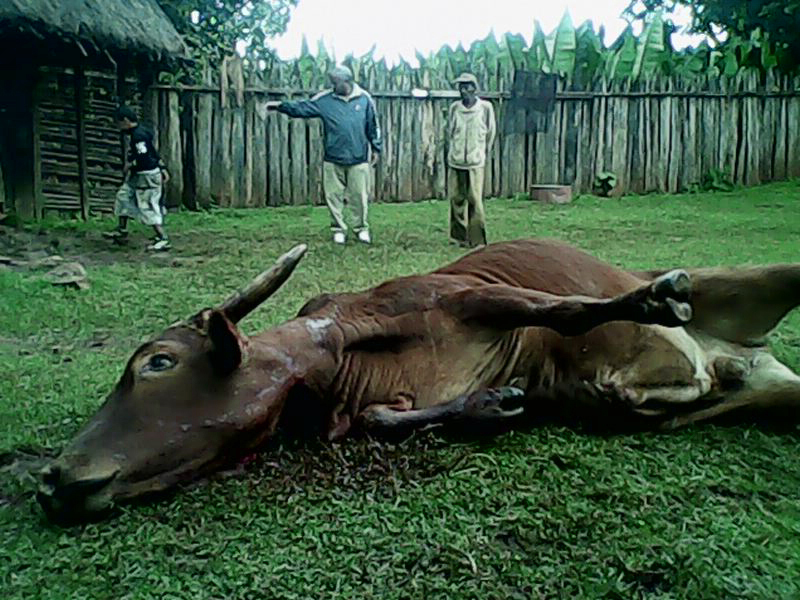 The men take a shot of local alcohol, and the bull is slaughtered. The bull has to fall to the right side, or at least be turned afterward on that side. The meat is prepared in a variety of ways and shared with celebrants, and can last a week. Celebrations there generally mix Catholic and Orthodox except at liturgies, though in some places Orthodox will only eat the meat if it has been blessed and slaughtered by an Orthodox man, since he will usually hold to a more rigorous fast throughout the year than would be required of a Catholic. 1. 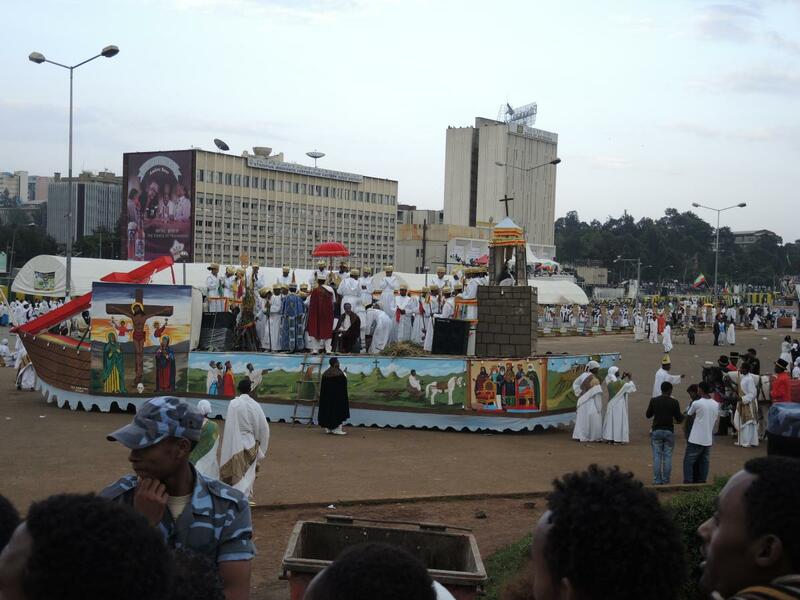 Steven Kaplan, "Finding the True Cross: The Social-Political Dimensions of the Ethiopian Mäsqäl Festival," Journal Of Religion In Africa 38.4 (November 2008): 449. The date was originally during Lent, but changed to the current date, probably turning pre-Christian traditions into a Christian feast. 2. 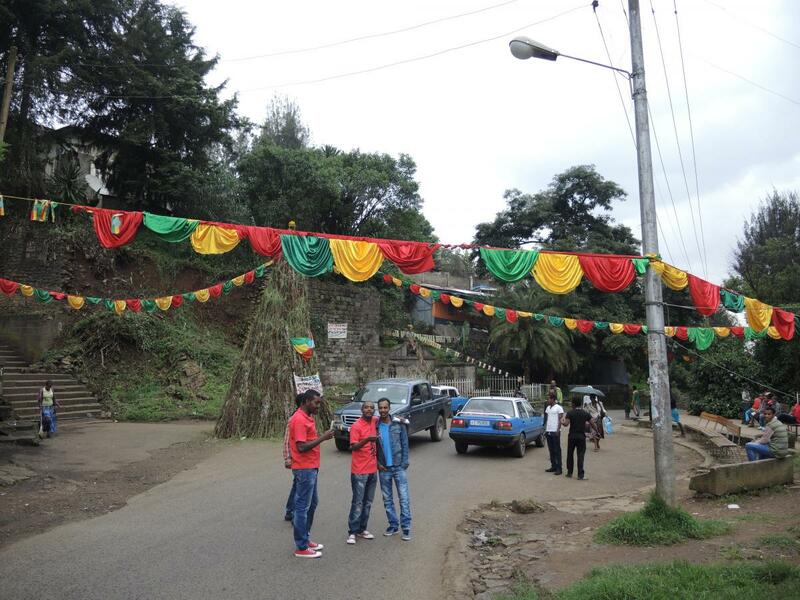 For a brief introduction to Gurage customs and social structures, see Nahu Senay, "Gurage," in Peripheral People: the excluded minorities of Ethiopia, ed. Deena Freeman and Alula Pankhurst (Lawrenceville, NJ: Red Sea Press, 2003), 33-45.